$10,000 reward for helping get cool towns built! It’s time we used the power of the net, crowdsourcing, and the beta community – in other words, you all – to help spend what amounts to $150 million in equity capital that would invest in places like this, at a minimum of $5 million per investment (not enough impact otherwise). The related question to the one above is who are the next generation of real estate developers and cities that want to see that happen and only lack capital to do so? So, CoolTown Studios is offering a $10,000 reward, payable immediately upon the actual investment transaction, if you can refer such a progressive, high-integrity real estate developer (yes, they’re not all bad) to utilize this kind of capital (I will keep you updated on what happens with your leads no matter what happens). To the developer’s relief, the investment entity takes a passive role. Now, because of the amount of $ involved, it has to be a development team (rather than an individual) who has demonstrated success among its members, and remember, this is about building communities for the audience associated with this site’s readership. That’s what this is all about. If you’d like to be part of a national beta community to help develop such a place, wherever it is in this country, contact us (email link to the right) and start meeting other people who share your vision. 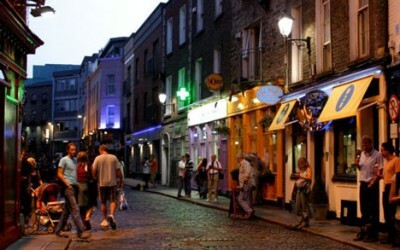 Image: This is the Temple Bar district in Dublin, Ireland It was almost demolished in the 1980s, and is one of the most economically, culturally prosperous destinations in the country today. Neil, do you have a list of beta communities that have already been formed or ones that you’re working with? Or is it part of the exercise that in order to be part of the community, you have to find it or it has to find you? There is one in Louisville, and varying interest in starting one in South Bend (Notre Dame) IL, Los Angeles, Washington DC, Grand Rapids MI, Albany NY and Cleveland OH. More on the way. There is a business model for local beta community organizers, but that’s another entry for the near future. The beta community must have ties to either an implementor (ie a developer) or investment capital to truly be defined as such, otherwise it’s just an advocacy group (not that there’s anything wrong with that). I am doing everything and more I’m doing in Syracuse, NY!! The 10k would allow me to sleep well for one night. :) If not the 10k it sure would be nice to talk to someone that could really help my efforts and the other people in the city I’m working with.